Following my earlier posts about Mike Lacey and Jimmy Hansen, I thought I'd post this page from Whizzer and Chips dated 30 May 1987 since, thanks to reader Matthew Blaken's enquiry on the Whizz-kids page we know (as if there was any doubt) that the cover story is drawn by Mike Lacey. 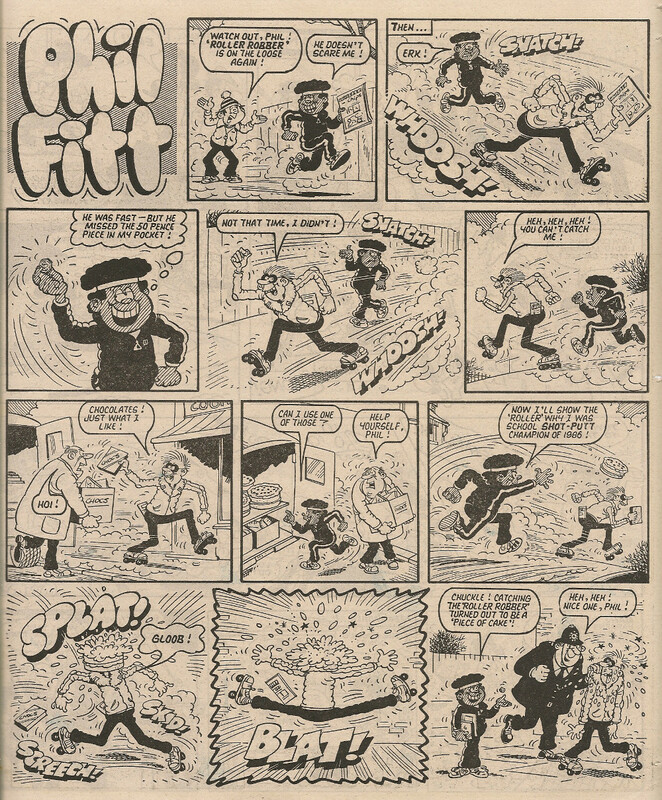 Although Sid doesn't mention it (possibly because the strip in question is located within rival comic Chips), Mike also drew Phil Fitt in that issue. ..I like the security guard with club and slavering hound, and it's always good to see Miss Wobblethrope get a namecheck. 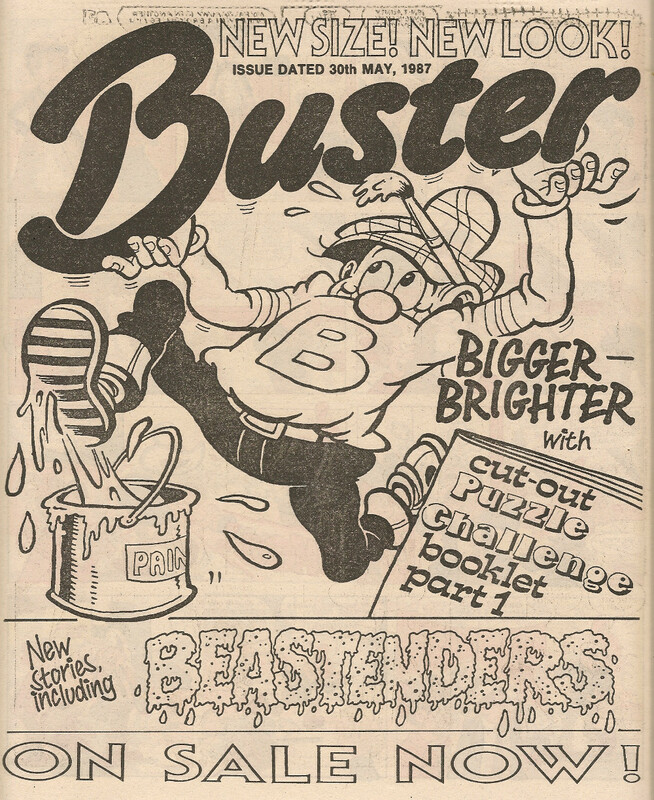 Yes, that same week IPC stablemate Buster had undergone a 'bigger-brighter' transformation. 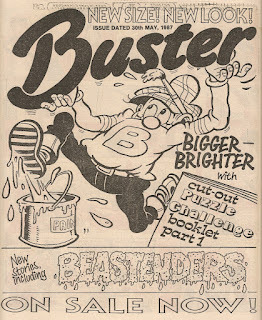 Now, I haven't got many copies of Buster and I certainly don't have the issue referred to above. 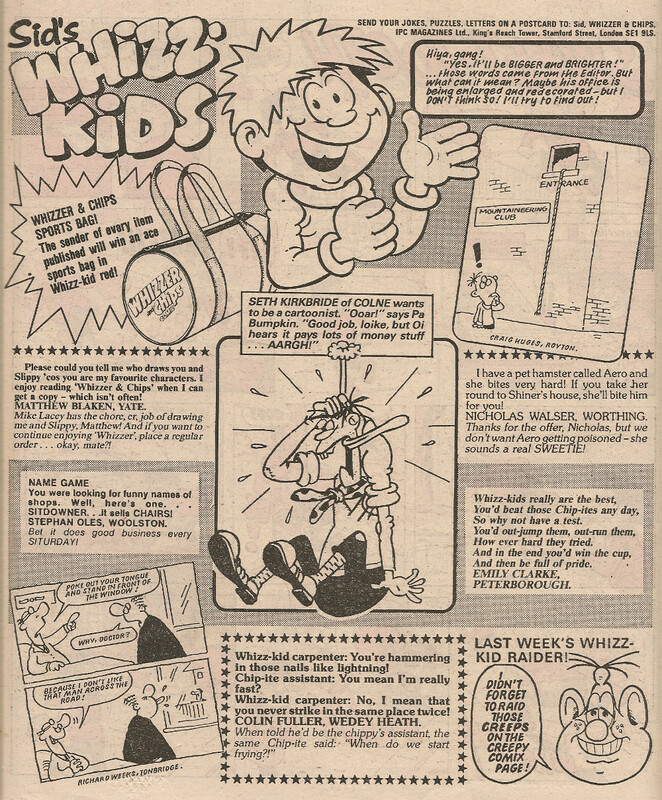 However, if it's anything like the 13 June 1987 issue of Whizzer and Chips (the first supposedly bigger issue), I think IPC were flirting with a somewhat fluid interpretation of the word 'bigger' as, while the pages of the new-style issue were slightly taller than those which preceded them, they were also narrower. The number of pages remained the same at 32, and although there was more colour, not all of the colour pages were in full colour. The paper quality was slightly improved resulting in clearer printing. 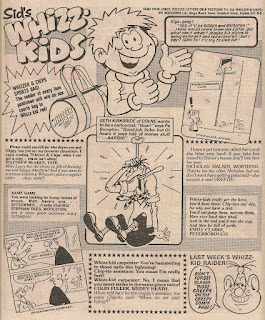 Anyway, all this excitement lay in the future for readers of the 30 May 1987 edition of Whizzer and Chips, which was a nice issue with a number of interesting happenings (in addition to those I've posted above) which I thought I'd share with you. ...good to see Cheeky getting a mention even though it is just the punchline to a botty joke. 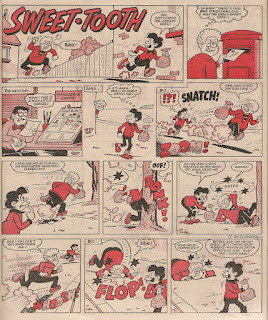 Here's Sweet-Tooth, including an artist self-portrait wherein Trevor Metcalfe is seen accepting a bribe! 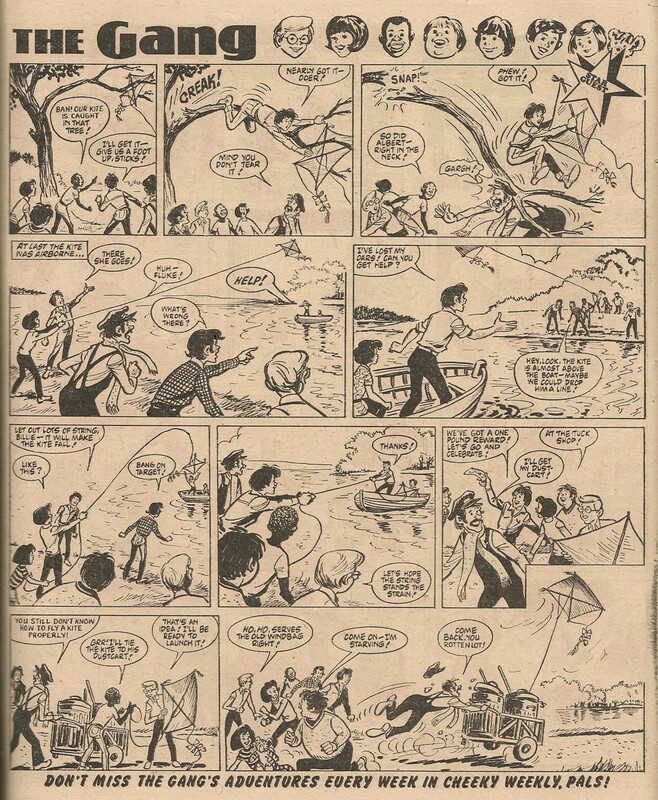 ...I really like Barry Glennard's work on Mustapha, it livened the strip up nicely. As if having the Lacey/Hansen uncertainty to contend with wasn't enough, an old controversy that I thought had been resolved has just re-emerged - in this interview, Colin Whittock refers to the artist above as Len Hill! I thought we'd solved the riddle of 'Mr' Hill's surname back here. I'm sticking with calling him Bob! Labels: Bob Hill, Mike Lacey or Jimmy Hansen? 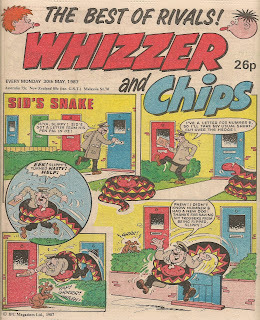 Week 17 of IPC's 1979 Star Guest promotion (in participating comics cover-dated 21 July 1979) means attention turns once again to Whizzer and Chips. In fact this is the 9th and final Cheeky Weekly Star Guest visit to the famous 'two comics in one', as we have reached the promotion's penultimate week and Whoopee will be hosting the concluding Cheeky Weekly Star Guest. So which strip has been chosen to make the final promotional sortie into Whizz-kid and Chip-ite territory? 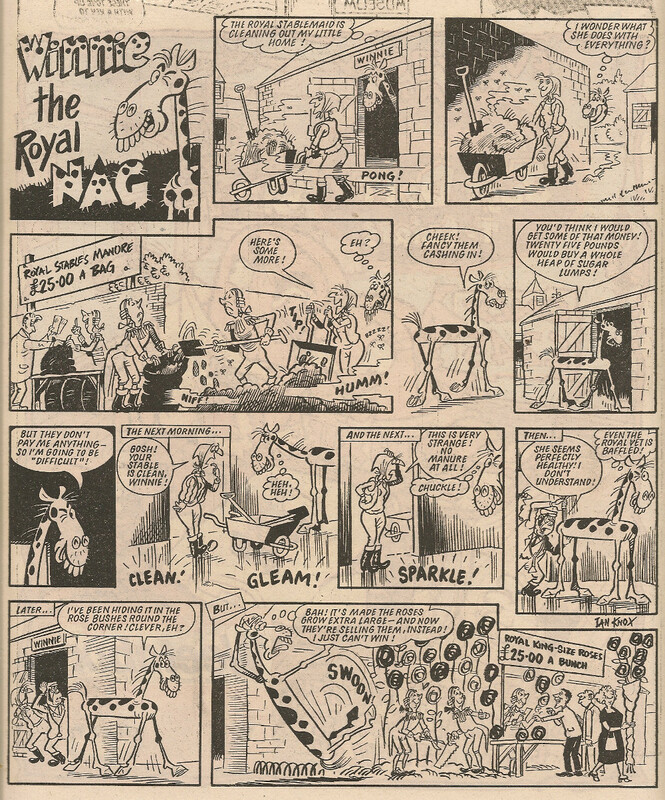 Any long-time Whizzer and Chips readers will immediately recognise this strip as a rehash of The Double Deckers, who graced W&C's pages from 1971 – 1972. 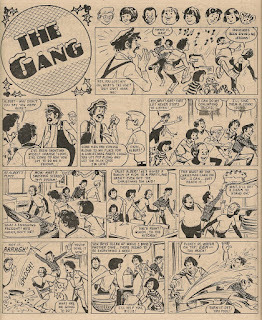 Reprints, altered and retitled somewhat unimaginatively The Gang, commenced in Cheeky Weekly just 2 weeks ago, in the issue dated 07 July 1979. 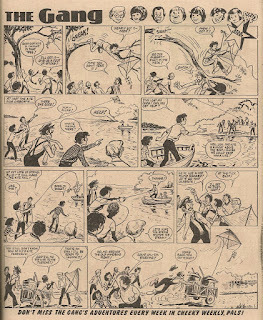 All the Double Deckers stories I have seen from the original run were 2-pagers and this, together with the fact that the above strip commences with our heroes in the midst of an arboreal predicament, suggests that this may just be the second page of what was originally a double-page spread. Given that the strip originated in Whizzer and Chips it's a bit of an odd Star Guest choice. Admittedly there are unlikely to be many readers still taking the comic who were reading it 7 years ago when the first Double Deckers series ended and would recognise this as a W&C cast-off. But surely Star Guest should showcase the best/most popular features that Cheeky Weekly has to offer, and clearly there has not been sufficient time to collect any reader feedback on the popularity of the strip in the 2 weeks since The Gang first appeared. To select an old and hacked-about story from an untried (in its altered form) strip just adds to my impression that IPC management had little enthusiasm for Cheeky Weekly by this stage, and were beginning to run the comic down as the inevitable merge loomed. 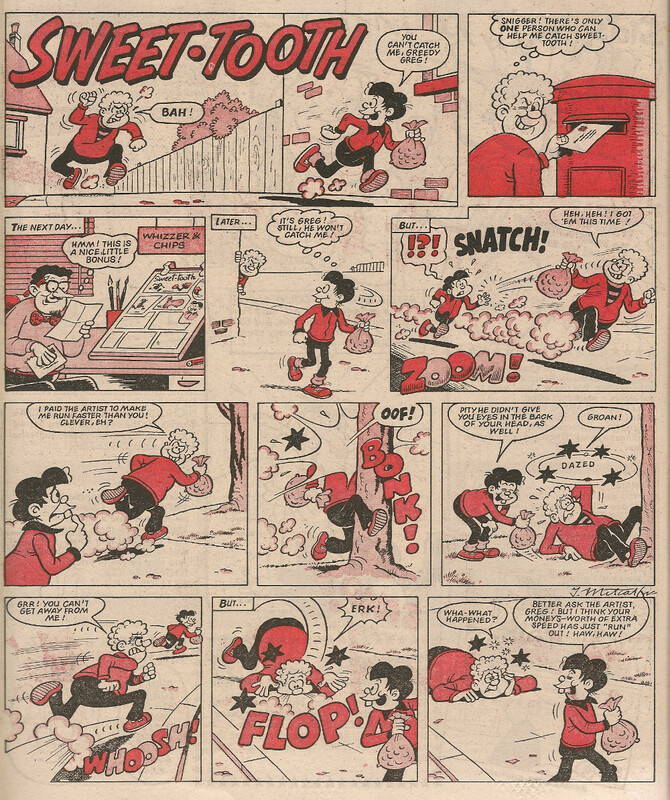 The message at the bottom of the page wasn't wrong as The Gang did indeed appear in Cheeky Weekly every week from their debut in the 07 July 1979 comic until the final edition, meaning any readers adopting the toothy funster's title as of the concurrent issue would have 'enjoyed' 29 episodes of erstwhile Double Decker doings. 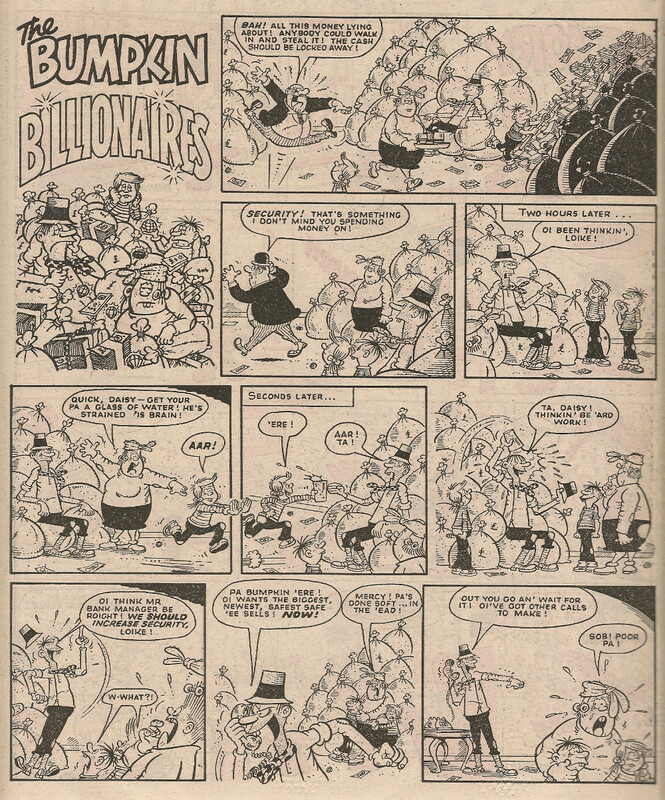 Gangs of various descriptions have been a staple of British comics since newsagents began selling weeklies packed with strip cartoon fun. From the Casey Court Kids via their Bash Street colleagues to The Krazy Gang (numbering in their ranks a certain toothy funster of our acquaintance), comic fans have enjoyed seeing an unruly bunch of youths contending with authority in all its comic-portrayed forms (usually teachers or coppers). Cheeky Weekly hadn't indulged in gang-based fun prior to the 1979 revamp issue. 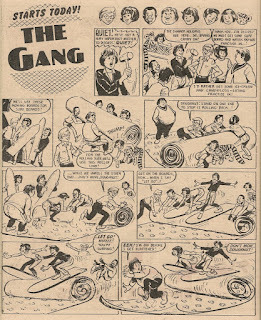 Skateboard Squad/Speed Squad were too public-spirited (and too few) to be regarded as a gang, and although the huge cast of the Cheeky's Week features would certainly satisfy the requirements of a gang in numerical terms, they just weren't a cohesive bunch with the requisite 'them against the world' feel of a true gang. Thus it was a bit of a surprise to find two gangs elbowing their way into the comic in a single week. 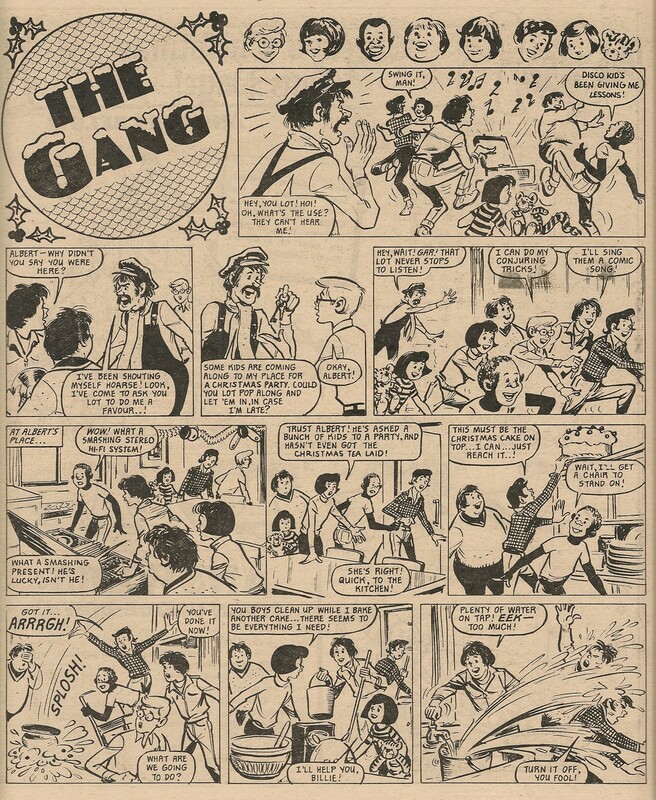 The second new gang of the aforementioned 07 July 1979 revamp edition, making their debut on page 14 of the issue in question and putting a showbiz spin on the archetypal kids-versus-teacher setup was Stage School. 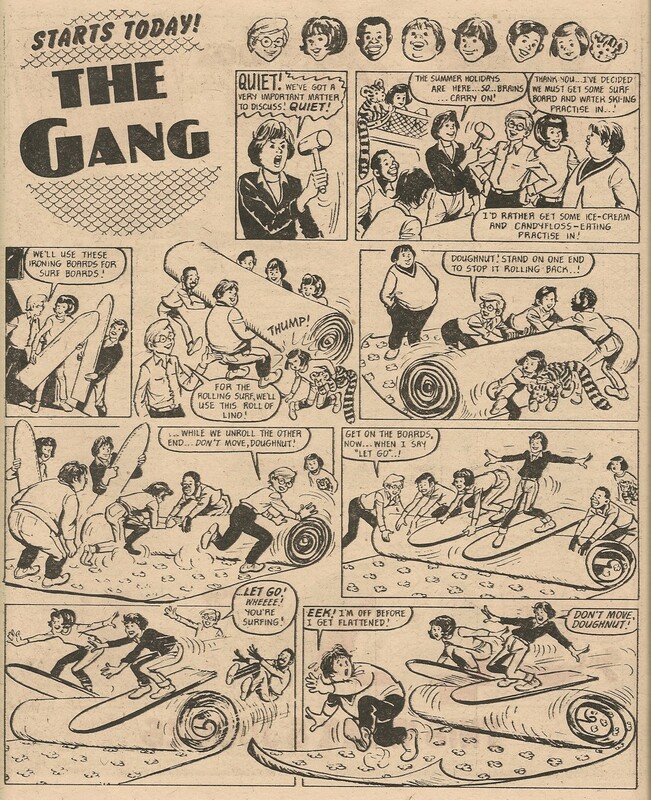 However, blazing the trail of Cheeky Weekly team-based fun as it premiered on page 10 was a strip so blatantly gang-focused that it bore a stark name – The Gang. 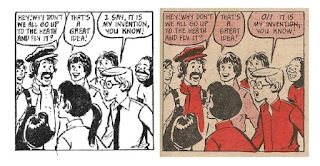 Was this, then, a distillation of all the gang strips that had preceded it, an utter refinement of the gang genre, ripping away all superfluous ideas and reducing the concept to a basic kernel of truth? Er, actually, no, it was just a retitled reprint of The Double Deckers from Whizzer and Chips but no-one could be bothered to think of a better title. Here Come The Double Deckers was a children's TV comedy/music show which premiered in the UK in January 1971. 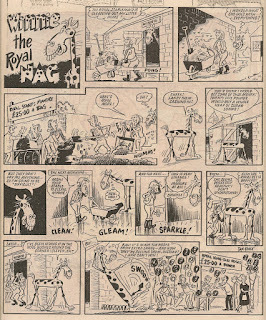 The titular youths lived in a London bus (static, I hasten to add), and the comic strip version commenced, under a banner reading 'Here's a brand-new fun feature with a new brand of laughter! The T.V. 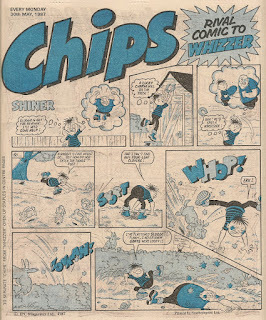 success...', in the Chips section of Whizzer and Chips dated 22 June 1971. 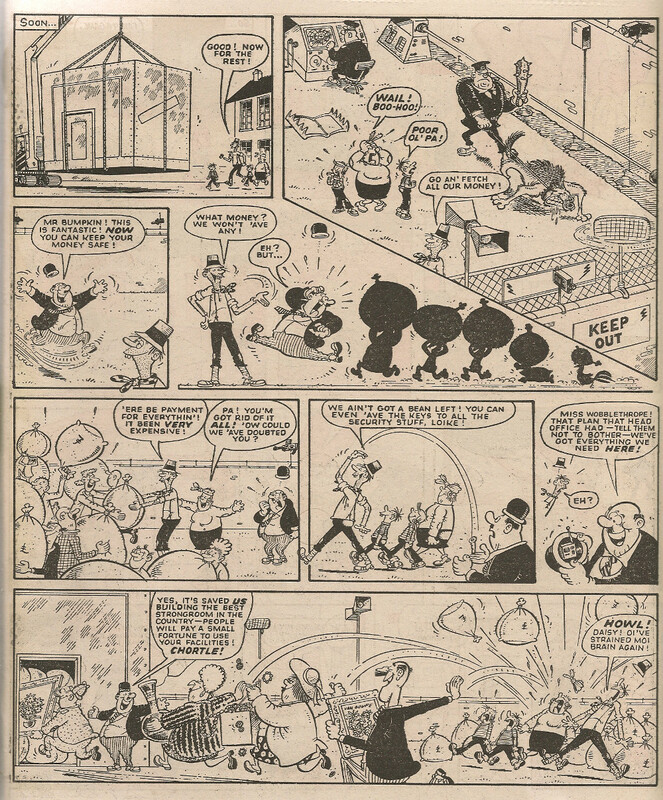 The strip's title was reduced to 'The Double Deckers' and the title panel incorporated a vintage bus design as well as carrying the copyright of Twentieth Century Fox Films Inc (copyright on subsequent strips in the W&C run was assigned to Twentieth Century Fox Film Corp. & Century Film Productions Ltd.). Quite what sort of arrangement IPC had with the property's owners is a bit of a puzzle, but presumably the copyright at some point expired to a point which allowed the publishers, with a little judicious adjustment, to use the artwork again 8 years later. Cheeky Weekly 07 July 1979. 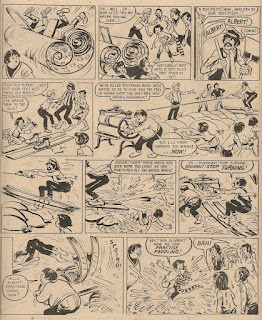 Sections of the bus are only occasionally glimpsed in the course of the stories contained in the reprinted strips (and The Gang's unusual home is directly mentioned only in the 15 and 22 September and 06 October 1979 adventures), but the kids' vehicular lodgings weren't particularly prominent in most of those of the original which I have seen (the story in which The Double Deckers repaint their omnibus dwelling, which originally appeared in Whizzer and Chips dated 07 August 1971, wasn't among those reprinted in the Cheeky run). Along with the substitution of the title, removal of the bus motif, and excision of the copyright notice, certain further tweaking was performed in preparation for the strip's Cheeky Weekly outing. Billie's pigtail was removed and the offensive depictions of Spring (the black member of the team) were redrawn, while his name was changed to Joss (or Jos on one occasion). Brains' tie was also drawn out. 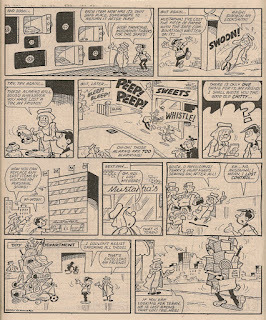 Curiously, some onomatopoeiaic embellishments of the 'zip', 'zoom' variety were also added to certain panels. 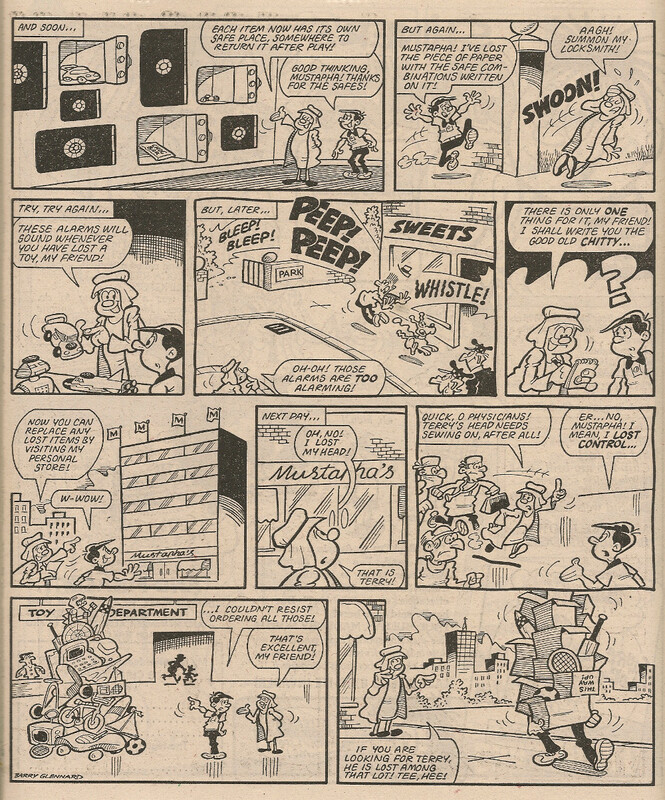 Despite these amendments, any Cheeky Weekly readers having a passing acquaintance with the Double Deckers' screen adventures (which had almost certainly been repeated at least once in the years since its premiere) would have instantly recognised the similarity between The Gang and the TV show. An example of altered artwork. and his tie was too smart! 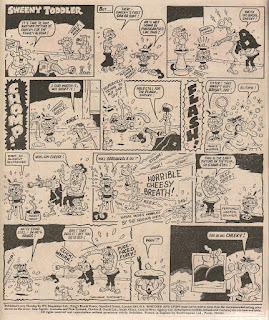 The story that originally appeared in Whizzer and Chips dated 09 October 1971, concerning a children's party was, on its 29 December 1979 Cheeky Weekly reprinting, converted into a Christmas tale by the addition of some seasonal dialogue and Christmas decorations. Joss/Spring was, in a scene showing him dancing, allocated a speech balloon reading 'Disco Kid's been giving me lessons'. 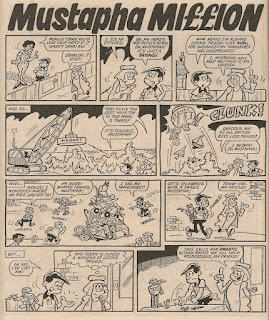 This wasn't the only occasion on which The Gang was tied in to Cheeky's Week - in the 02 February 1980 story, Scooper is seen reading a comic whose title has been altered to 'Cheeky'. However, these were the only attempts made to connect The Gang with the rest of the toothy funster's comic. One of Cheeky Weekly's unique features - the linking of all the various strips into our grinning pal's week (e.g. James Bold being framed within Cheeky's Week as a novel read by Cheeky and later viewed at the cinema, Creepy Sleepy Tale being a bedtime story told to Baby Burpo etc) - was dropped as of the 1979 revamp. Cheeky Weekly was entering a decline by this stage in its life. Because of this connection between the arrival of The Gang and the drop in care taken over the production of the comic, I've always been unsure whether my dislike for the strip is justified. On reflection, I realise that I like Stage School, which appeared in the same circumstances (although to be fair Stage School isn't a reprint which is another reason why I'm not a fan of the young bus dwellers), so sorry Gang, but you just didn't do it for me. 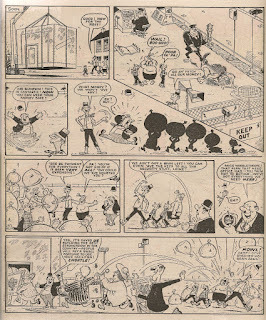 Robert MacGillivray was the artist on all 31 Cheeky Weekly episodes of The Gang, all of which were 2-page stories. 15 stories were in spot colour (red) with the remainder in black and white. 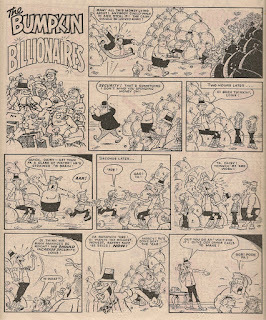 The reprint run was uninterrupted from its debut until the final issue. 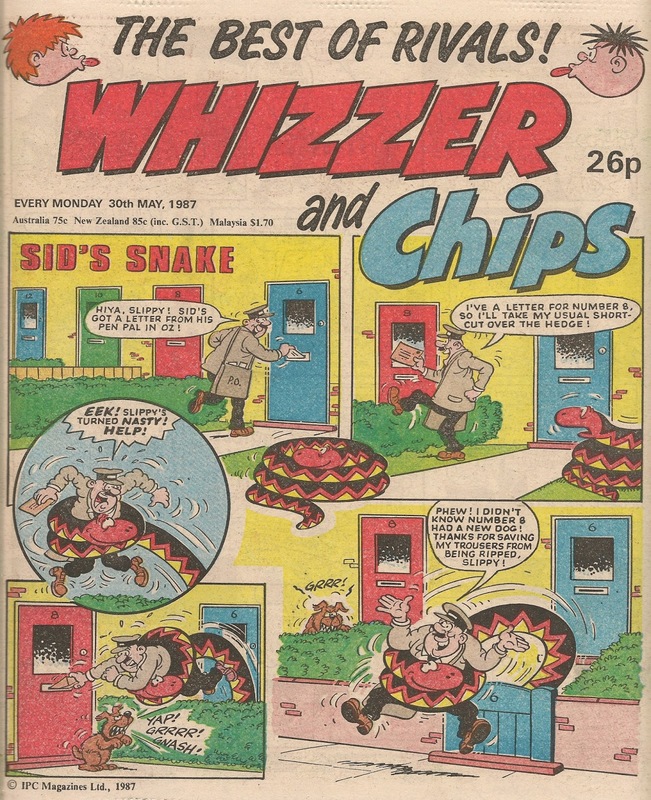 Wikipedia suggests there were 52 strips in the original Whizzer and Chips run of The Double Deckers. 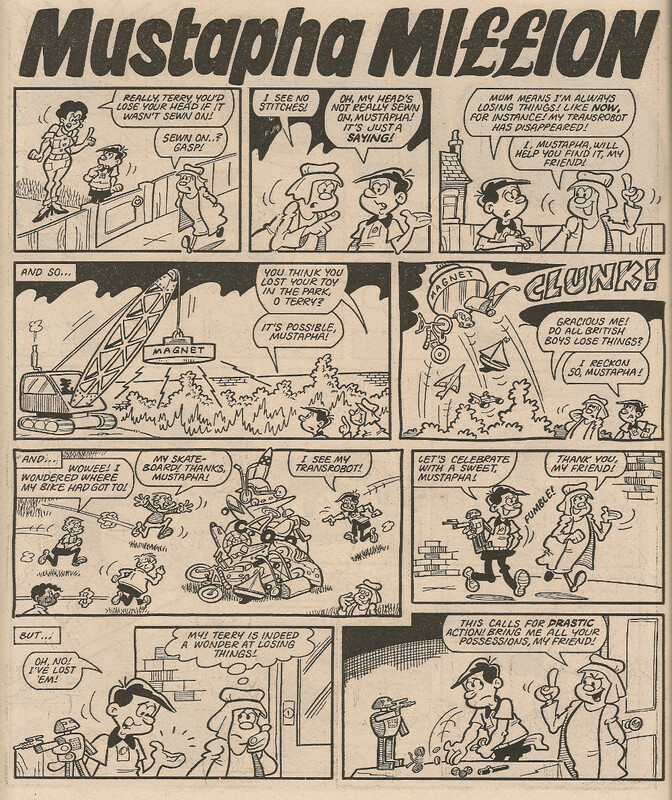 The Cheeky Holiday Special 1980 included 2 Gang adventures reprinted from Whizzer and Chips, and 2 Gang adventures were featured in the Cheeky Annual cover-dated 1981. In the case of the Annual, the artwork was resized to convert each of what had originally been 2-pagers into stories spanning 4 Annual pages. Oddly, although Billie's hairstyle was redrawn for the reprints in the Holiday Special and Annual, as it had been in the weekly comic, no alterations were made to Joss'/Spring's face to match those made in the weekly Gang stories. 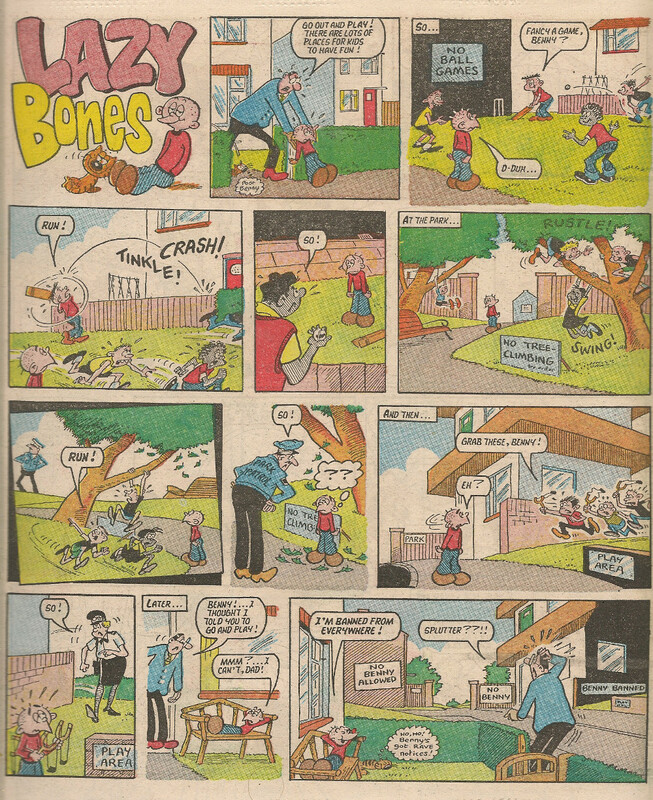 The first Gang story in the Annual was printed in full colour (the second was in black and white) and had some text altered to refer to Krazy Town. 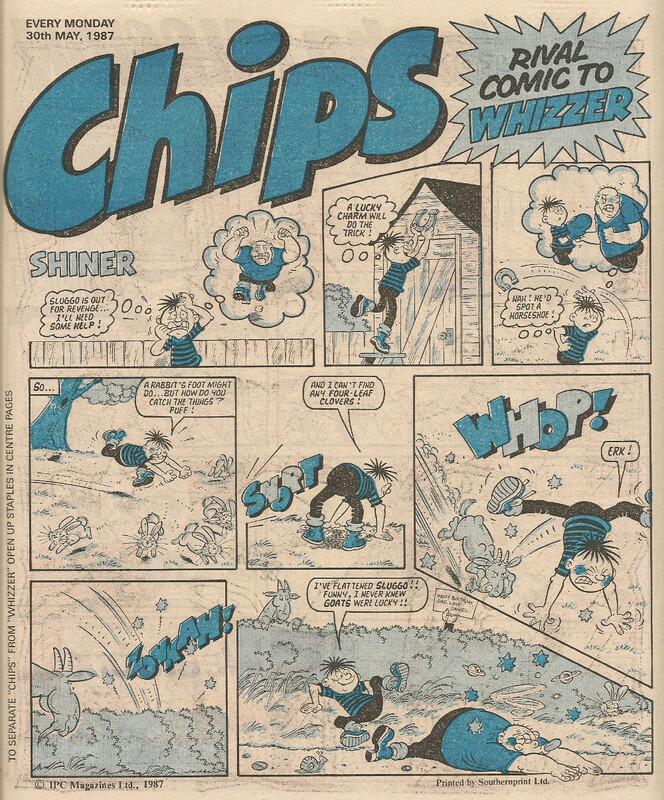 The Gang also participated in IPC's 1979 Star Guest promotion, ironically paying a visit to their comic of origin, Whizzer and Chips, dated 21July 1979. In this case it appears their story was edited down from 2 pages into a single page. 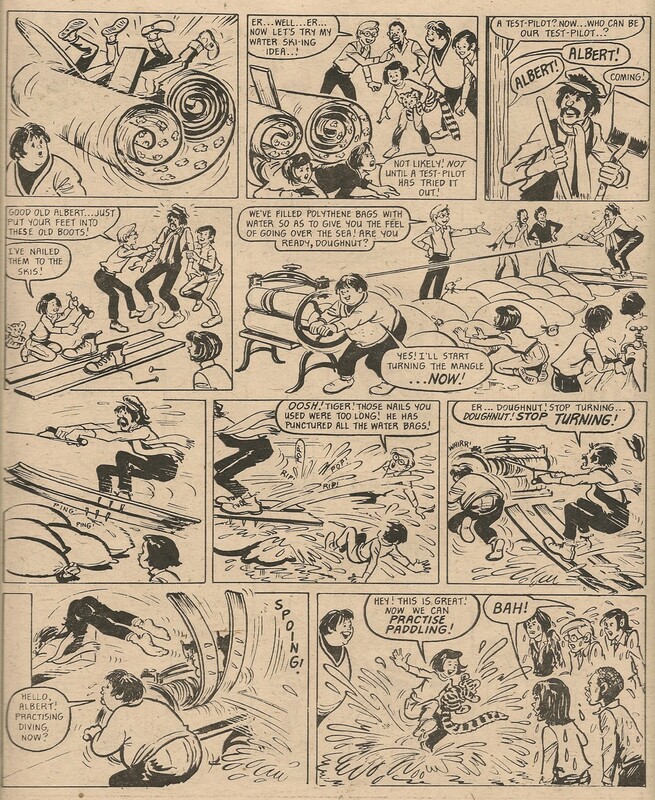 This page on a Double Deckers fan site suggests that The Gang was reprinted in an 'Australian magazine' in the late 1970s, but I suspect the reprints referred to are those from Cheeky Weekly. The example pages shown have been incorrectly paired up. 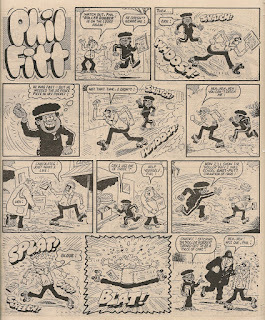 Peter Gray has posted some lovely Cheeky work from the Silver Jubilee edition of Krazy (in the days when Cheeky still had a 'K' on his jumper - he changed his pullover to one bearing a 'C' as of Krazy dated 20 August 1977 in his own strip, although it was a week later before the toothy funster's C jumper appeared on the Krazy Gang pages).